No Land! No House! No Vote! Voices from Symphony Way (2011) is an anthology of 45 factual tales written and edited by the controversial Symphony Way Pavement Dwellers. The foreword to the book is written by the well-known activist and author Raj Patel and the introduction is penned by Miloon Kothari, Former United Nations Special Rapporteur on the Right to Adequate Housing. The book follows hundreds of shackdwellers in the township of Delft in Cape Town. In early 2007, they were moved into houses they had been waiting for since the end of Apartheid but soon were told that the move had been illegal and they were removed from their new homes. In protest, they occupied Symphony Way, a main road opposite the housing project. It soon blossomed into a settlement of hundreds of shacks inhabited by organised protesting families. It became known as Symphony Way and was the home ground of the Symphony Way Anti-Eviction Campaign, whose membership vowed to stay on the road until the government gave them permanent housing. The community was eventually evicted after almost two years occupying Symphony Way. They were moved to the infamous Blikkiesdorp temporary relocation area where they are still struggling for land and housing. The stories are real-life accounts of the struggle of the pavement dwellers. The overall theme in the book is their struggle for land, housing and dignity as human beings. However, the stories also cover many general issues within the poor communities, from simmering relationships, to love, to hate, to physical abuse. Their concerns range from safety on "their" road to their insecurity with regards to their pending eviction because of the 2010 FIFA World Cup. Another recurring theme throughout the anthology is how the struggle enabled the pavement dwellers to build a strong community on the road. In his forward, Raj Patel says that the book, which is "both testimony and poetry...opens the door to a world of compassion, of fellow-suffering, that holds you firm." Journalist and author Naomi Klein said that the book is "A beauty, extraordinary in every way." Leading figure of the academic left Michael Watts, called the book "a clarion call for basic of human rights and for human dignity". South African academic Richard Pithouse said that "this book really does capture something of the texture of an actually existing popular struggle." S'bu Zikode, President of the shackdweller's movement Abahlali baseMjondolo, claims "this book carries not only the suffering of the Symphony Way communities but of the millions of poor people of the world." Professor Emeritus and anti-apartheid struggle stalwart, Martin Legassick, says in his review of the book for Amandla! Magazine: "I wish I could bury the noses of Tokyo Sexwale and Bonginkosi Madikazela in its pages. Everyone should buy this book and read it". In his review in Red Pepper Magazine he says that the book is "a remarkable and moving volume, charged with emotion and satiated with reasonableness". ^ "2011: Year of interesting books coming". NigerianCompass. ^ "No Land! No House! No Vote!". Thinking Africa. ^ "No Land! No House! No Vote! Voices from Symphony Way". FahamuBooks. ^ "No Land! No House! No Vote! : Voices from Symphony Way [Paperback]". Amazon. 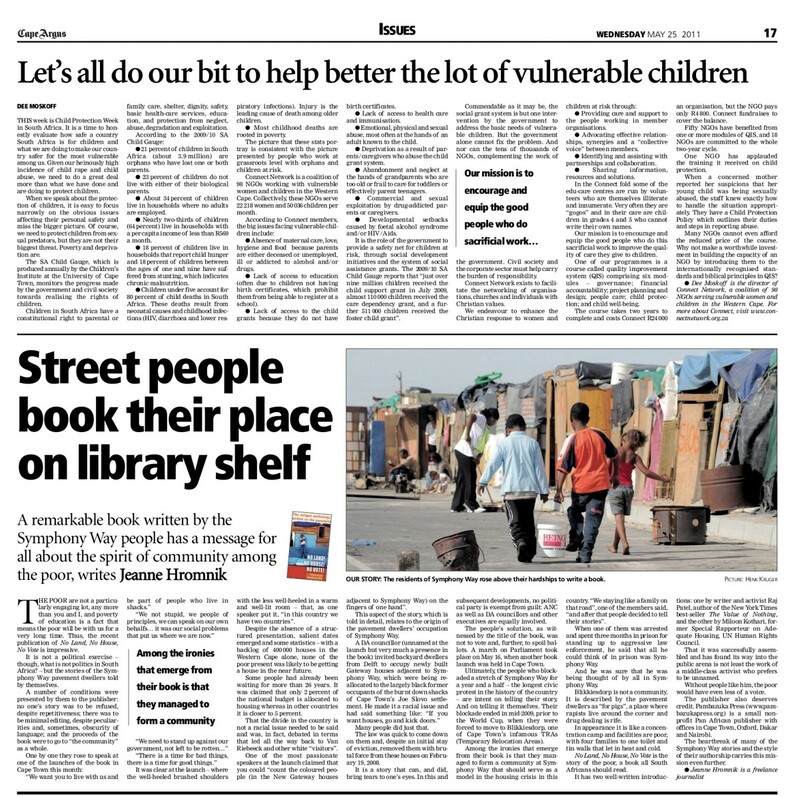 ^ "Review: Street people book their place on library shelf". Cape Argus. ^ "The Symphony Way". Raj Patel. ^ "No Land! No House! No Vote! : Voices from Symphony Way". FahaumBooks. ^ "No Land! No House! No Vote! : Voices from Symphony Way". Thinking Africa. ^  Review by Martin Legassick,Amandla Magazine.